So it's 1st of Feb and lovely blogger Aavahg invited me to accept her February challenge, post many different her listed posts everyday! Omg, I am sure I won't be able to do it everyday, 'coz it's insane! Of course! I would not leave my house without a bottle of my favorite fragrance. 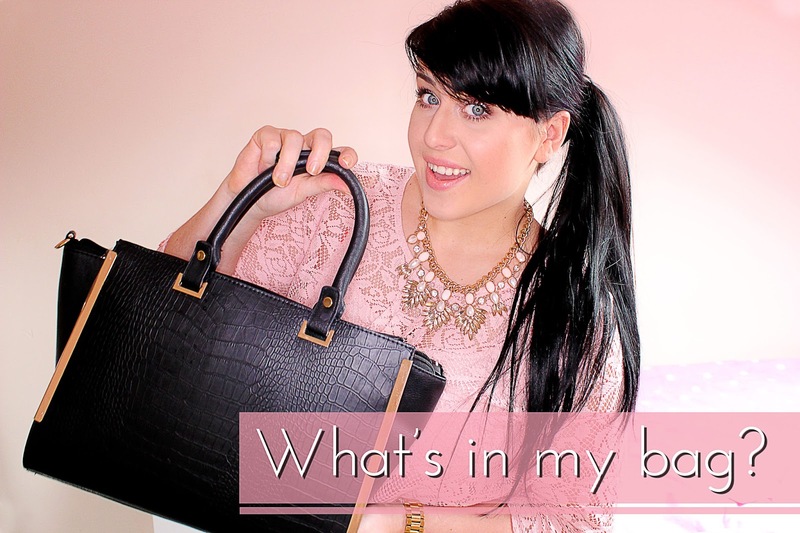 I know, it just an extra weight in my bag, but I like to know that I always smell nice! Well, thats obvious. Mobile phone has never been left at home, so as hand cream. I hate my hands being dry, so I will always have something to moisturize it. I have to admit, you would always find cinema tickets in my bag. I, literally, spend more time at the cinema than at home. One ticket changing another, so here is my latest seen movie 'Most violent year'. I will ALWAYS have sunglasses in my bag, no matter what season we are in. First because I am obsessed with eye wear, second I have very sensitive eyes and it gets watery in the sun or because of the wind. Makeup products would be lipstick , of course, and some other stuff like lipliner or mineral powder, to fix my makeup during the day. Headphones is must have in my bag! My TT is always traveling with me, anywhere I go, for obvious reasons. And notepad is to write down ideas for blog posts, or reminders 'coz I have the worst memory on earth! This mirror means a lot and it's always with me. I've got it on the first holiday with my boo, it has the date engraved of the day we met. Charger cable is necessary, as I use my phone a lot, so the battery won't last me all day. I love reading books while I'm on my way to work, it's a great way to 'disconnect' myself while I'm on the bus. I've just finished book by David Pelzer ''A man named Dave'', it's very inspiring work. It's my second read of this author. Highly recommend to read his books. Back to my bag, last would be my purse, of course. Bank cards, advantage cards, coupons, money and some coins hiding inside. Your wallet is so cute!